Freemasonry is the science by which morality is taught through the visible symbols and instructive traditions associated with the erection of King Solomon’s Temple some 3,000 years ago. Like every science and permanent institution, Freemasonry is built on certain conceded principles. These include a belief in the one living and true God, a revelation of His Will, the resurrection of the body, and the immortality of the soul. When we say "one God," we refer to whatever Supreme and Benevolent Being in which a man places his ultimate trust. We are a non-denominational institution accepting men of all faiths. Freemasonry is the ardent supporter of every religion. It denies to no man his particular theological or secular beliefs, but rather complements and fulfills those beliefs. Without an expressed belief in these principles, no man can ever become a Freemason. Acceptance of the Fatherhood of God is the very foundation of the Masonic Institution; from this Fatherhood logically flows the Brotherhood of Man. The Masonic Fraternity stands before the world today, not merely as a marvelous monument of antiquity, older, larger and more widely spread than any other human institution, but as having maintained for so many centuries the essentials of its primary organization. It has long outlived the circumstances which gave it birth. Originally an association of operative stonemasons and builders, whose monuments of rare skill still adorn almost every part of the old world, the hands of time have brought those operative labors to a close. The Everlasting Principles, however, upon which our beloved Craft was founded, are as intact today as they were when it emerged from the very shadows of prehistory. Thus, over the centuries, as the demand for builders of physical temples has subsided, Freemasons have transitioned their efforts to building "spiritual temples" in the hearts of men. Our ancient Brethren sought to erect temples fit for worship. Freemasonry’s great mission today is, and forever shall be, to make those who worship fit to enter those temples. Since its founding, dynasties have come and gone, nations have been born and buried, and countless orders and societies have been organized and passed into obscurity. Our Order alone has maintained its ancient organization, teaching its lessons of love, peace on earth, goodwill toward man, and is today greater and stronger than it has ever been. Freemasonry is a broad system of Morals and Ethics. That is, a science of human duties, whose principals are accepted by all religions as essential to human excellence. The cornerstone of these principles rests upon the recognition of a Divine Truth that mankind has a common origin and a common destiny; and that God is the Creator and Father of all of us. Out of that relationship with Deity grows the Brotherhood of Man. Freemasonry’s great purpose is to intensify that relationship. Thus, Freemasonry teaches Love, Faith, and Duty, unites man in the strong embrace of fraternal fellowship, and induces emulation of who can best work and best agree. Freemasonry thus becomes a system of spiritual education wherein is taught not only the virtues, but also the useful lessons of everyday life. The Temple of King Solomon signifies to us the Temple of our bodies, that is, our Inner Spiritual Temple. The tools and implements used in the building of Solomon’s Temple signify to us the cultivation of the virtues to be practiced in the erection of the inner spiritual temple of man. The traditions associated with Solomon’s Temple serve as worthy examples for our imitation, and to inspire in us a love of all that is good and true. Freemasonry teaches us that the most important part of life lies in the discharge of our duties toward God and our fellow man. That eminent patron of Freemasonry, St. John the Evangelist, when so old that he had to be carried in the arms of his friends into an assembly of children, lifted himself up and said: "Little children, love one another." When asked, "Have you nothing else to tell us?" he replied, "I say this again and again, because if you do this, nothing more is needed." That, dear reader, is the foundation of Freemasonry. Freemasonry is not a mere pastime; not a mere amusement. It is an active, living principle. Its ritual, its symbolism, and its drama are not empty ceremonies. Formed and perfected over the centuries, they serve to exemplify and impart important truths for mankind. 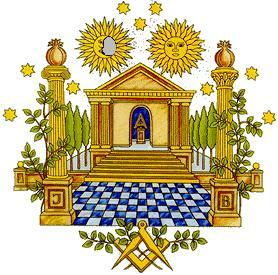 Freemasonry adapts its theories, its ethical thought, and its teachings to the practical relations of life. There are no dogmas in Freemasonry. Its so-called "secrecy" is confined to simple means of communication and methods of recognition. Its tenets are universally approved. What Freemasonry condemns no good man upholds. The essence of Freemasonry is character. A man is what he does. The Mason’s manhood and worth is not measured by wealth, fame or fortune, but by faithful, consistent and unselfish service. In like manner, the measure and worth of any institution is the effect it has upon the individual and society. What has Freemasonry given to mankind and society? It paved the way for freedom of speech. It has ever been the enemy of any power that suppressed free thought and the enslavement of the mind. It rejects the bigotry and superstition that erected inquisitions and persecution of all types; and the ignorance and fanaticism that invented instruments of torture and deprivation. It points out to man that free thought and free speech, and the study of the sciences, are necessary for mankind’s mental and intellectual emancipation; that the study of nature brings man’s soul nearer to his Creator; and that knowledge drives out ignorance and superstition. It has taught mankind that, after he has emancipated himself from the vices that tyrannize and oppress, he must learn to govern himself wisely by practicing the Cardinal Virtues of Freemasonry: Temperance, Fortitude, Prudence, and Justice. Man is a social creature. As such, our nature compels us to seek the companionship of others. We, therefore, see our Brothers and their families, animated by the same noble purpose, meeting in the Lodge where they can feel the hearty touch of the hand, hear words of inspiration and encouragement, and enjoy the pleasure, entertainment, and fellowship of this time-honored institution. While gathered in these great assemblies, we confer our ceremonial degrees, provide relief to the indigent, assistance to the worthy, and administer systems of care to those who are less fortunate. Freemasonry is all of this and much, much more. Beneath and beyond all of these is the deep, permanent passion for the betterment of the Brotherhood of Man. Freemasonry, as the ardent supporter of religion, benevolence, and morality places before man the incentives to goodness through the contemplation of the Holy Principles of Divine Truth. The tenets our Ancient Order are Brotherly Love, Relief and Truth -– and first among them is Brotherly Love. It is the very cement which holds together the social edifice of this world. No one can measure the extent of human sympathy or brotherly love, but we know it to be one of the mightiest social forces of all time, and that without it, life would be a merciless and cruel existence. We know that when there is an unselfish love in the hearts of men, the better nature within each of us responds in kind. It is this kindly spirit of Brotherhood, the gentle touch of the hand, and the sympathetic word that brings forth a harvest of good deeds, noble thoughts, and the highest aspirations of mankind. Freemasonry has ever been the patron of learning. Its votaries long ago discovered that ignorance was the mother of nearly all of the evils and dangerous environments that afflicted humanity; that education dispelled this evil, set free the victims of its influence, and put a smile where terror and despair had planted sorrow. In its unending efforts to eliminate such human afflictions, Freemasonry has perhaps performed its greatest labor, breaking down the walls of religious hatred and intolerance that for too long divided men into opposing sects and hostile camps. The great religious ecumenical councils of today, and the religious tolerance and mutual understanding they endeavor to convey, has been the foundation and practice of Freemasonry since time immemorial. The Freemason is thus prepared through ceremonies, ritual and moral lessons to undertake his grand mission to teach, by precept and example, all that is beautiful and useful in this life, and to prepare for life hereafter. After all of the great lectures on philosophy have been delivered, when the wisest statesmen shall have done their utmost to alleviate what is harsh and cruel in social conditions, and science shall have unraveled the mysteries of the universe, there will still be the necessity for a kindly smile, a helping hand, a cup of cool water, and a quiet word of encouragement. It is because Freemasonry has ever given the cup of cool water, extended a hand to one who has fallen, and spoken the words of comfort and cheer, that millions of good men of every religion and culture, and from every corner of the world have knelt at its altar. It is these same men, Brothers in spirit and deed, with eyes uplifted and hearts responsive to the needs of those who are journeying through life with them, that form the Masonic Fraternity throughout the world. It is the good and true men of this Brotherhood that live with the great satisfaction which comes only from relieving suffering, dispensing happiness, and to aid the unification of mankind. Our charitable efforts today are many. The Masonic family encompasses many different organizations. Men's organizations include the Blue Lodges, the Scottish and York Rites, the Ancient Arabic Order of the Nobles of the Mystic Shrine, the Grotto, and the Knights Templar. Ladies organizations include the Order of the Eastern Star, which also includes men who are Freemasons. Youth organizations include The Daughters of Job and Rainbow for Girls for our young women, and the Order of DeMolay for our young men. Each of these organizations has its own unique ceremonies, and supports charitable and philanthropic causes. Every day the Masonic Family is responsible for contributing literally millions of dollars in charitable donations, and thousands of volunteer hours to worthwhile causes of every kind. This, my friends, is Freemasonry. May it live on through us for countless ages, and may we be ever worthy to spread Masonic Light for the generations yet to come. To these, our principal beliefs and poetic truths, we say as our forefathers did before us: "So mote it be." We hope that men of a higher character who seek to share in our Brotherly Love, who wish to contribute to the relief of others less fortunate, and who use Divine Truth as the cornerstone of all their endeavors will consider joining the oldest, largest, and most prestigious fraternal organization in the world – Freemasonry. Accepted Masons of the State of Missouri. All rights reserved.